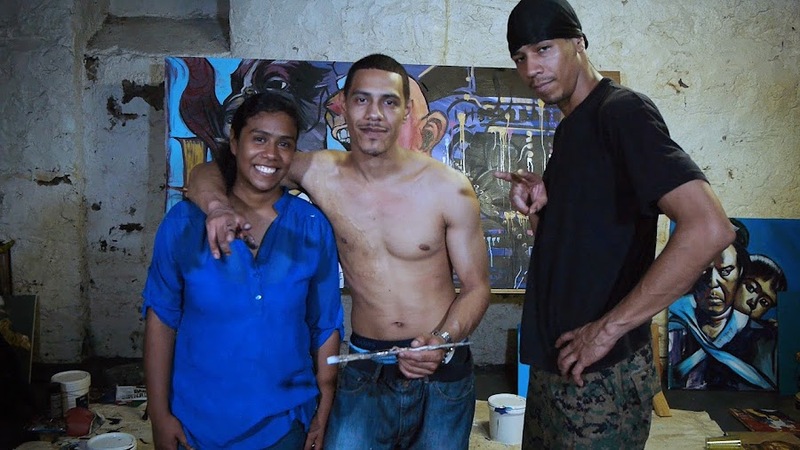 I met NYC street artist Marthalicia Matarrita in the summer of 2013 as I was visiting my family (mother, brothers & sisters) in the Bronx. Whenever I'm in NYC, my younger brother and I like to look for interesting street artists to make short videos on and after producing videos for artists Dasic, Icy & Sot and Leghead, I was looking for a female subject. I came across Marthalicia online and sent her an email asking if she had anything going on. She responded and told me she was working on a mural in the Bronx the next day. We agreed to meet up at the Tilden Avenue projects where she was finishing up her mural. We began chatting and she told me that she grew up painting with her two brothers and that they used to paint together all the time in a basement studio in the Bronx. I asked if she could get them together so that I could film them all working. She told me it had been a while since they all painted together but that she would try. Later that day, she called me to tell me that she was able to get them both to agree to meet up in that very basement studio to work on a piece with their very distinct styles. I met them there that evening and over the next 6 hours in a sweltering hot basement studio, I saw them working together - the first time they had in years. They also shared with me their personal stories of overcoming poverty and extreme living conditions through their love of art...and the light of a candle. "The Candle" is their story. I shot and edited the film, which runs just under 6 minutes, and it stands as one of my favorite works; a film I'm very proud of. The film has also screened in a handful of small film festivals over the years since it made its premiere at the 2014 Indie Boots Film Festival in Chicago. It has also screened at film festivals in Los Angeles, Trenton (NJ), San Antonio, the Dominican Republic, Buenos Aires, and Barcelona. It's a modest little film shot over the course of just one afternoon and evening but the message it carries is poignant and every one of us can learn something from it. It's also a film that I'm very, very proud of. I hope you enjoy it (your feedback is welcome!). The Candle: A Short Documentary Film about the Power of Art (and Family) from DanPerezFilms on Vimeo. The Candle [La vela] from DanPerezFilms on Vimeo.